In October of 2017 Dee and I had the opportunity to visit the Nashville Flea Market, our first time attending this event, one of the biggest and best of its kind anywhere in the country. As we wandered the grounds and checked the many buildings looking for whatever caught our eyes, I was drawn to one particular booth. A couple that looked to be just a bit older than Dee and I had a space that specialized in antique radios. As I scanned the display, it was clear that this couple truly had a love for and an understanding of antique radios, nearly all of which clearly dated to the 50s, 40s, and 30s. They were in excellent condition and of course, one could purchase anything they had. However, I immediately had a different idea. 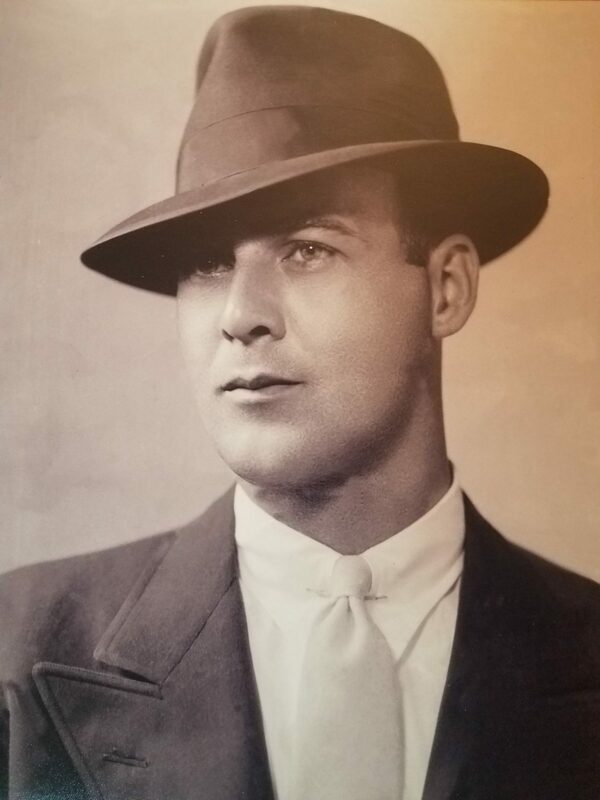 I had an old radio that belonged to my grandfather, Edward Lindsey, and it had been in my possession for more than 40 years, ever since he passed away in 1976. It was all original, but it did not work and was in great need of repair and restoration. I struck up a conversation with the gentleman who owned the booth, and after a few moments, I asked my question: ” Do you ever accept old radios for repair?” The answer was ‘Yes” and we talked for a few more minutes, before I told him I would be back the next day with the radio. I returned the next day as promised and gave him my radio to take back to his home in Huntsville, Alabama. I asked for his card which he retrieved from his wallet and we parted. Later that evening I did a bit of research. It turns out Marc is the former CEO of a major military defense contractor! Alhough he retired from that position a few years ago, he continues today as chairman of the board. 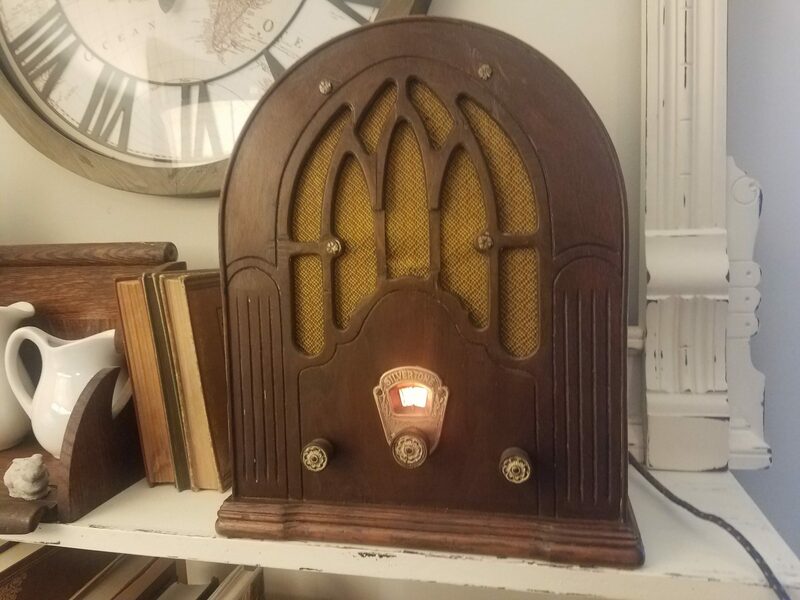 Radio repair and restoration is one of his passions and he certainly ranks as an expert, not only in repair and restoration, but also in understanding the history of old radios. He is a humble man, but my guess is that he is a nationally respected expert in the field. Finally, I received word from Marc that the primary and hard-to-find part, the speaker, was acquired almost by accident in Ohio. He was able to add a couple of replacement tubes, the electrolytic capacitor, and the grill cloth. He then reassembled the radio, tested it, and pronounced it ready for pick-up. We made arrangements for Dee and I to drive to Huntsville on February 4th to pay Marc for his work and to bring the radio home. Grampa Lindsey’s 1935 Magnavox radio: fully restored and working great! Here at home, I had to complete the final steps which included cleaning and refinishing the case, and then reassembly. Fortunately, everything went back together without difficulty and we now have a perfectly working radio, albeit just the AM band. What a beautiful addition to our home! 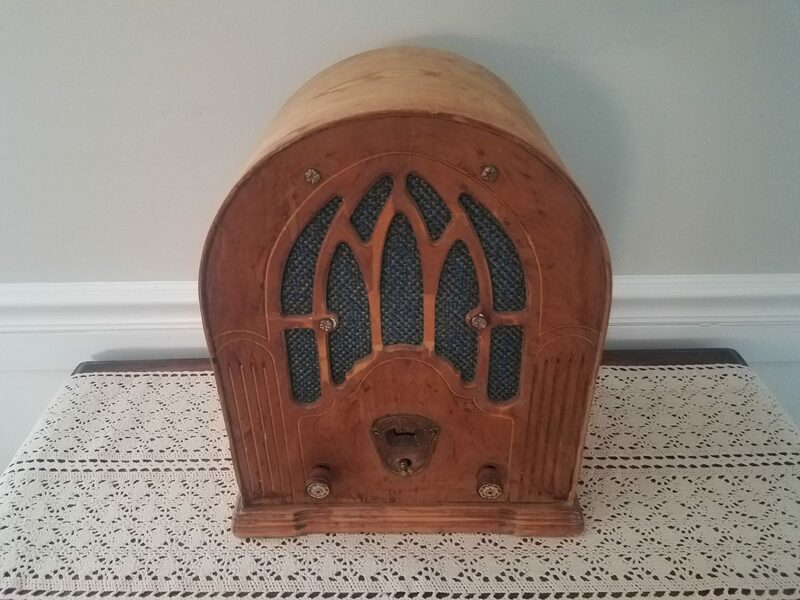 The radio is a Magnavox, originally sold at Sears Roebuck, and dates to 1935. My guess is that until Marc applied his expertise, it had not worked properly in perhaps fifty years or more. I’m certain my grandfather would be pleased, and today it has an honored place in our home. Thanks Marc, for a restoration project that was very well done!